As a Mount Vernon Leadership Fellow, Ben Goldfein, a rising junior at Emory College, will live and study this summer at George Washington's historic estate near Washington, D.C.
Ben Goldfein, a rising junior at Emory College, has been named one of 16 Mount Vernon Leadership Fellows for this summer. Goldfein, a philosophy major, will be the first Emory College student tapped for the honor, and part of just the second class in the competitive leadership program that calls for students to live and study at George Washington’s historic estate near Washington, D.C.
“My goal is to facilitate the integration of international student life into more aspects of the American college experience, while simultaneously positioning Emory University as an international global powerhouse that sets the example for other collegiate institutions,” Goldfein says. “Becoming a Mount Vernon Leadership Fellow will give me the time, inspiration, guidance and support I need to bring my ideas to fruition and develop a viable action plan,” he adds. The cohort will meet with nationally recognized corporate, government and military leaders during the five-and-a-half week program that focuses on Washington’s character, leadership and vision, as a statesman and military leader. Goldfein was selected from about 200 applicants from 40 states and the District of Columbia for the honor. Members of the 2016 class are pursuing a variety of degrees, from neuroscience to accounting to political science, at several top universities. Goldfein, who is from Atlanta, will be a visiting student at the University of Oxford next year as one of 25 students in the St. Peter’s College Visiting Student Programme. He will study philosophy, politics and economics (PPE), with a focus on analytic and moral philosophy. 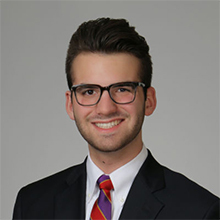 On campus, he is involved with Emory’s satire magazine, The Spoke; serves as the vice president of recruitment for the Sigma Phi Epsilon fraternity; and is a sophomore adviser in Turman Hall. He is also a professional magician and black belt in Tae Kwon Do. For more information about the program, visit mountvernon.org/fellows.